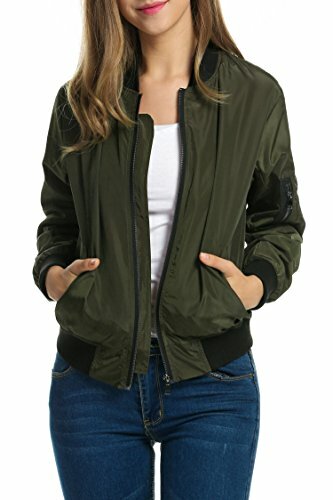 Zeagoo Women Classic Solid Biker Jacket Zip up Bomber Jacket Coat Army Green S by Zeagoo at Femi Store. MPN: AMH005237_AG_S. Hurry! Limited time offer. Offer valid only while supplies last. Specifications: Please check your measurements to make sure the item fits before ordering. 1. Use similar clothing to compare with the size. 2. Casual bomber jacket, spring, summer and autumn wear this will more suitable.